One of the first mistakes that beginning sewers make is not paying enough attention to the fabric they choose. Fabric isn’t something that seems very mystifying – you walk up and down the aisles of your local fabric store, or sit on your couch and cruise the virtual shop of your choice until you find something that looks appealing. Unfortunately for you, choosing fabric simply because you like the color or pattern can completely ruin your project. You do not want to make the mistake of putting in hours at the machine only to end up with a disaster. Think of the wasted time and money. Your fabric is used, your time is gone, and you end up with something you cannot wear or use. As a beginner there are fabrics to avoid. If you see a project that suggests any of these fabrics, skip it. You can come back to it when you have more experience under your belt. Here are some things to remember as you are shopping for your perfect fabric. A heavy duty sewing machine like this Singer 4423 are a must when working with heavy fabrics like denim and leather. While leather is not technically a fabric, it deserves mention because it is available in certain stores. Both denim and leather are thick, making each a nightmare for beginners. Not only can they be hard to cut, but you could end up dealing with broken needles and jammed machines. In addition to being tough to work with, unless you have bought a more expensive sewing machine, you do not have the necessary needles or accessories at the ready. That means spending more money purchasing the proper supplies like a high quality heavy duty sewing machine. There are beautiful fabrics available on today’s market. You can find gorgeous prints, fabrics that are embellished, and even those that are sheer and shimmery. Do your best to tear your eyes away, never choosing a fabric based on looks alone. Here are three types of fabric every beginner should avoid. Sewing with Satin – Just how Difficult is it? Satin fabric is alluring. It is shiny, silky and rich. In fact, satin can be quite mesmerizing when you are looking at it in the store. Do not be tempted. As gorgeous as this fabric is, it is incredibly difficult to work with because it has no grab. What that means to you is that it will slip and slide as you are trying to work with it. It is hard to cut correctly, and it is even harder to sew properly. How to Sew with Knit and Jersey Fabrics – Practice, Practice, Practice! Knit and jersey fabrics are perfect for clothing projects. Sadly, choosing these fabrics can ruin your project if you are not familiar with their subtleties. Both types stretch, making them tough to work with. Leave them too loose when you are sewing and they pucker. Stretch them too tight when you are sewing and they gather. Unless you are making a simple pair of curtains, avoid fabric with very intricate patterns until you gain more skill. If not cut correctly, your project could end up looking like a jumbled mess. When you are just starting out, stick with larger patterns that are easier for you to match when you are putting your project together. What is the Easiest Sewing Fabric for Beginners? Now you know which fabrics to avoid. It may feel like you have nothing left to choose from, but you do. Cotton is the number one fabric choice for beginners. The good news is that it is also the most readily available and the most affordable. You can find cotton fabric in every color of the rainbow and any pattern you can dream of. As easy as cotton is to work with, it is not without its drawbacks. Cotton fabrics shrink when washed for the first time. If you want to do yourself a favor, always wash your cotton fabrics before you begin your project. If you skip this step, your project will shrink the first time you wash it, ruining its look and functionality. When you are picking out your cotton fabric, choose solid colors or large patterns for your first project. These are the easiest to work with, especially when you are putting a project together out of multiple pieces. Matching your pieces is simple with solids and large patterns. 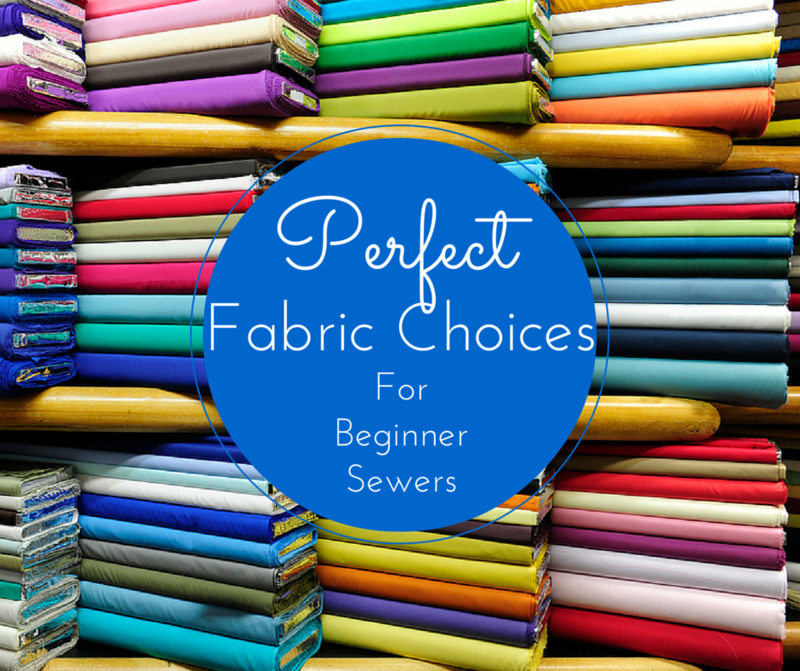 Even though it has some minor drawbacks, cotton fabric is still the best choice for the beginning sewer. Mistakes made with fabric can be expensive lessons. Those fabrics on the list of those to avoid are often the most expensive. If you feel as though you just cannot resist that shiny satin, try to wait for it to go on sale before making your purchase. That way, you’ll get the chance to get used to working with it without as much fear of making a mistake!